“Trindade is an oceanic island 1140 km off Vitória, Brazil. The Marion Dufresne Expedition (1987) recovered there many land snail shells, all stylommatophoran pulmonates. Here, four microgastropod species found in this material are recorded for the first time on Trindade Island: Lilloiconcha gordurasensis (Charopidae), Pupisoma macneilli (Valloniidae), Gastrocopta barbadensis (Gastrocoptidae) and Vertigo sp. (Vertiginidae). The last one could be a non-native, introduced species. Unfortunately, none of these species can be currently found alive on the island, which can be indicative of extinction”. Cunha, C. M., Salvador, R. B. & Simone, L. R. L., 2015. 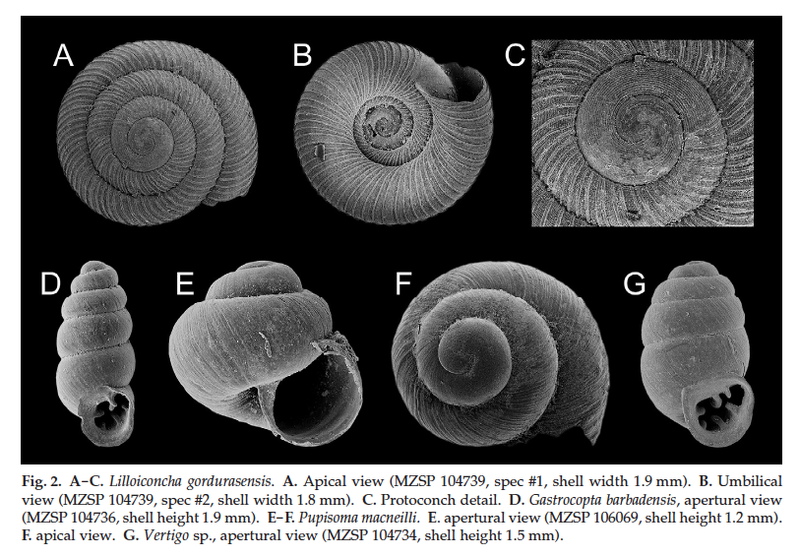 The terrestrial microgastropods of Trindade Island, Brazil (Gastropoda, Pulmonata). Spixiana 38 (1): 139-143. This entry was posted in Uncategorized on September 11, 2015 by bramb.